Lighting is the secret weapon in any production; it sets the scene and tells the audience how they should be feeling with dramatic lighting effects generating intrigue. On lower-budget productions it can also position them and tell them where they are; warmer light with added gels can create a rich chocolate tone to be used in period dramas for example. As a DOP there’s always the pressure to deliver something new — something bigger and better than anything seen before. When an image can speak a thousand words, the smallest of adjustments to your lighting setup, or the way you’re using it, can change the entire story. Here are four tips on what you can do beyond the basics to help make the most of your lighting setup when your set demands something spectacular. Where are you filming? What are you filming? These are just a few of the questions you’ll need to ask yourself before deciding what gear is going to suit you. They may seem obvious, but they will form the foundation of everything that comes next. If you’re filming people climbing a cliff face, you will want something lightweight that’s able to maneuver into unique positions to make sure your subjects are evenly lit. If you’re working with ice or snow — or if you’re filming in the middle of summer — you’re definitely going to want to be using cool running LEDs. This is exactly the issue that we encountered on our shoot for British primetime reality show, Dancing on Ice. 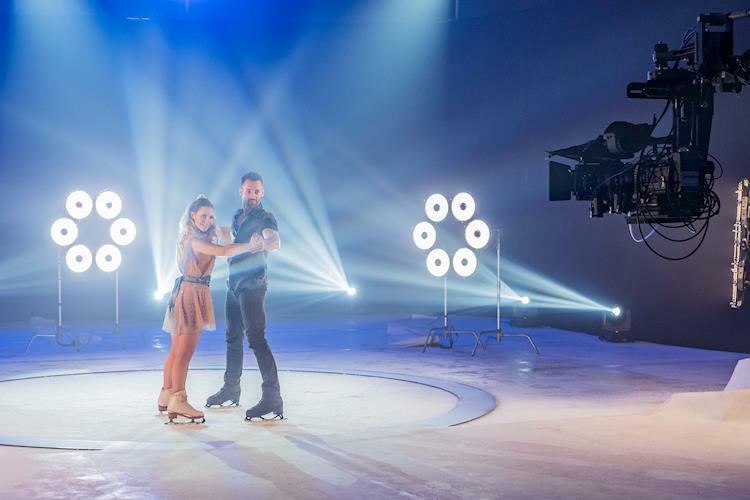 Filming in a literal ice rink, Rotolight’s cool LEDs were perfect for ensuring the set didn’t melt! We could put the lights directly onto the ice without having to worry about the heat. As a creative, it’s vital to think outside of the box, and your client is relying on you to do so, but the boundaries are constantly shifting and changing. Pushing yourself and your equipment is important to achieve unique results that your client will love. It’s a challenge for even big-budget productions like Dancing on Ice. The DOP, Chris Yacoubian, definitely felt the pressure bringing the show back with more glamour after its four-year hiatus, especially with more shows than ever fighting for the audience’s attention. “We wanted something new, fresh and original; something that was visually different and interesting. We used Rotolight Anova PRO 2s for our glamour shots; I saw them clustered together and that just sparked my creativity. The performance and functionality of the lights were important, but I also wanted to incorporate them into the actual shot to make it unique,” Chris recalls. The Anovas were mounted on custom-made hex rings which could be controlled via a lighting desk and five-pin DMX connection, that enabled the crew to remotely trigger and control effects. The unique circular design of Rotolight’s LEDs allowed them to be mounted on custom Rotolight hex rings in a flower formation; the combined power of the clustered Anovas creating impactful lighting sequences around the rink. With crews being asked more and more to shoot both stills and video for their clients, it’s important to remain versatile above anything else. Buying one light that does it all not only saves you money, but it also saves you time switching setups, and you never know what your client might demand at a moment’s notice. Your subjects aren’t always going to wait for you whilst you change setups, so take steps to make sure you’ll never miss that perfect moment again. Besides, no one wants to be hauling twice as much equipment as they need from set to set, so consider investing in a light with integrated High Speed Sync flash for any stills your clients want for press or promotional imagery too. Time is money, and that’s especially true when you’re on set. No matter the budget, it’s easy for costs to mount up, and short-term investments can end up saving you more in the long run. Firstly, get a light with superb build quality – something you can travel with that won’t let you down part-way through filming, potentially leaving you without a key light. Rotolight’s advanced LED lighting technology offers all this and more even on the most demanding of sets. With outstanding color rendition (CRI 96, TLCI 91), adjustable color temperature and an industry-first suite of built-in customizable CineSFXTM, the Rotolight range allows you to explore your spur of the moment creativity and enables you to achieve results that your clients will love.